Illuminated Manuscript Anthology of Persian poetry, Walters Art Museum Ms. W.653, fol. 19b, originally uploaded by Walters Art Museum Illuminated Manuscripts. This small anthology of Persian poetry consisting of poems by such authors as Jāmī, Azārī, Fayz̤ī, Navāʾī, and Saʿdī was put together by an anonymous scribe in 1105 AH / 1693 CE. Illustrated with six miniatures, the margins of this manuscript are embellished with stenciled designs of angels, men and animals. 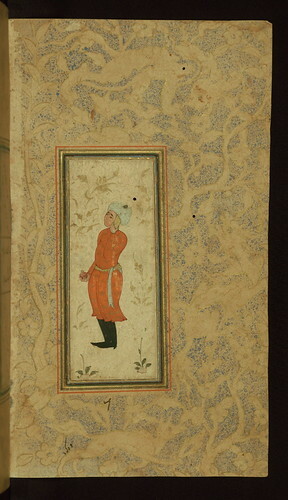 The folio illustrates a young man standing with a pomegranate in his right hand.